Donald Smith has been volunteering with The Country Trust for over 12 years. 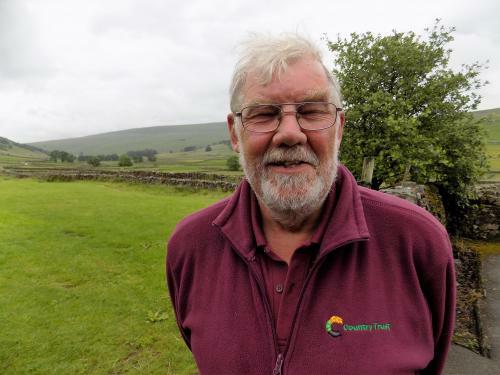 He lives in Shipley, West Yorkshire and for 6 weeks every year he spends his time supporting Country Trust Residential Coordinators Lee Holmes and Mark Scrimshaw with the smooth running of Countryside Discovery Residentials, in the beautiful Yorkshire Dales. Donald explains “The best reward I get as a volunteer for The Country Trust is seeing the children's faces when they’re pony treking and seeing sheep and cows for the first time, it gives you a really good feeling. At the end of each visit I will often ask the children if they want to carry on with their residential stay, or go home. They always want to stay, even though it means carrying on living in a bunk barn with no television, computers and mobile phones. It just goes to show how the simple pleasures in life like playing outside with friends, getting lots of fresh air and going on walks in the countryside can have a lasting impact on these children’s lives. There is never a dull moment during the visits, I help to drive one of the mini-buses used to transfer the children to the different places we go to. I take groups of children to the Kilnsey pony trekking centre, Gazegill working farm and into the beautiful village of Grassington, as well as visits to Hawes creamery to see how cheese is made. Along with Country Trust Coordinators Lee and Mark, we take the children on a spectacular river walk from Grassington to Burnsall (about 4 miles) and along the way I look out for anything interesting in the countryside to talk to the children about. The walk takes in a river crossing with a long row of stepping stones, which some of the children need help and encouragement getting across but is always great fun and gives the children an enormous sense of achievement. The main benefits of these visits for the children is being outdoors and learning about nature and the countryside - a very different environment to what many city children are used to. We organise a quiz for the children on the second evening of their stay and ask them questions about all the things they have seen and done. Just recently we had a school where one team got 20 out of 20 - it just goes to show how much these young people are learning and absorbing while on a residential visit with us.